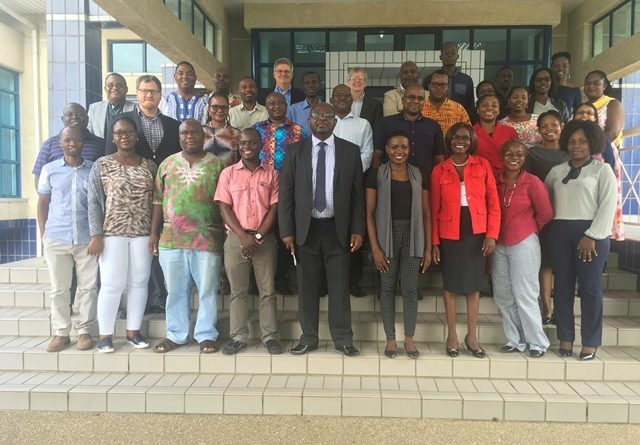 The Malawi University of Science and Technology (MUST) in collaboration with Lilongwe University of Agriculture and Natural Resources (Luanar) and Michigan State University (MSU) between March 19 and 21, 2019, held the second workshop for the Innovation Scholar Programme (ISP). This was a follow up to the first workshop that took place immediately after the ISP launch on December 4, 2018. Under the programme, which is supported with funding from USAID through MSU, scholars are being drilled on various systems of achieving innovation such as through design thinking and systems thinking. The scholars, who are using individual projects to put into practice the various innovation theories, are in four categories of faculty, administration, postgraduate and network. Addressing the participants during the opening ceremony at Moneymen Club in Blantyre, MUST Deputy Vice Chancellor Professor Jonathan Makuwira said the exercise was good for Malawi as times are changing and it was high time we needed to be innovative to address some of our challenges. “I would thus thank MSU for partnering with MUST, a new and small university. However, I believe MSU chose us because of our ambitions and capacity. Malawi has several challenges in science and technology and universities have to act as think tanks to come up with solutions. “I am also happy that this workshop is about thinking to come up with ideas and to be innovative. We will be glad to see the products from this thinking and innovations. It is my belief that they will be able to solve some of our national, even global, challenges,” said Professor Makuwira. He urged the participants to be positive to think and shape each other so that as a nation, we can turn our challenges into opportunities. MSU based ISP director, Dr Kurt Richter said they are in Malawi to advance MUST’s vision of being a world class centre of science and technology education, research and outreach. “We want together to practice innovation and believe that innovation is not magic. We want the programme to provide a platform for participants to learn from each other. It is not like we are experts who have come to teach you how to be innovative. Through our interaction and through working together, we will see how best to be innovative,” he said. He said MSU decided to extend ISP to MUST following its success at Luanar. “As MSU we are not bringing any technology, the scholars under the programme will come up with various technologies. We believe that it is only Malawians that can think and come up with things that can work for Malawi. “How will we achieve this? It will be through working together by having workshops, coaching sessions and excursions. As such, our expectations are that participants will support each other; and create something under the programme,” added Dr Richter. He said through this approach, all innovations by the scholars will be accredited to MUST and in so doing, the ISP would be create a new MUST that is innovative and utilises design thinking and systems thinking. The MUST ISP, which is coordinated by Associate Professor David Mkwambisi, has around 50 scholars and facilitators come from Malawi and the USA. Among others, scholars include MUST university registrar, Dr Tarsizius Nampota, Director of Finance and Investments Macdonald Hudge, University Librarian Martin Thawani, academics Priya Samson, Dr Atikonda Mkochi, Dr Paul Makocho, Dr Charles Fodya, private sector staff Fred Munthali, Lucia Mkhango and postgraduate students Gilbert Chimalizeni and Patricia Likongwe.